forOur initial visit and estimates are free of charge! Curtain Tracks and Poles. (including fitting in Bay Windows). Luxury Blackout Blinds including bloc 99% Blackout with virtual no light bleed. 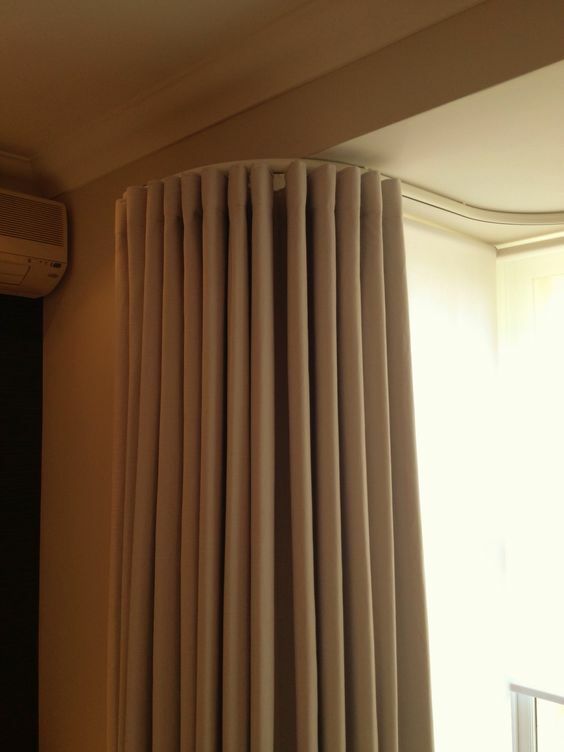 Roller/Roman Blinds made in Customer's own fabric. When invited, I will visit your home, take measurements, photographs and create a mood board if required. I can at this stage discuss a budget in order to create an interior space that would be ideal and meet with your specification. At Ambiance in Gateside you can view these inspiring wallpapers. From the captivating beauty of cultivated gardens, to the enchanting allure of rolling meadows and wild woodlands, Botanical ~Botanica~ studies the magnificent transformation of nature throughout the seasons. Capturing much-loved blooms including the headily perfumed perennials Lilac and Wisteria, native beauties Sweet Pea, Bluebell and Rose, and the delicate foliage of Fern and Maidenhair, the collection celebrates the remarkable diversity and innate beauty of the garden. Colour palettes are also inspired by the ever-changing landscape with the pastel promise of early spring and dazzling vibrancy of summer hues, through to the autumnal tones of turning leaves and crisp, cool colours of frosted winter, the garden provides a plethora of palettes to suit a vast range of interior styles and settings. Botanical ~Botanica~ brings the beguiling beauty and colourful charm of nature into the home with 15 original wallpapers. 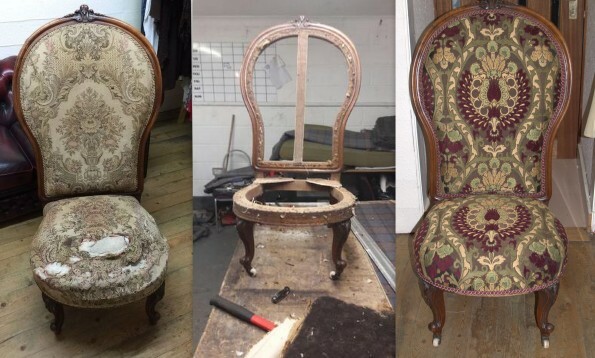 Call in, phone or email us to discuss your requirements to have your furniture upholstered, restored or both. Send us a photograph with a few sizes and we will happily send you a free estimate. 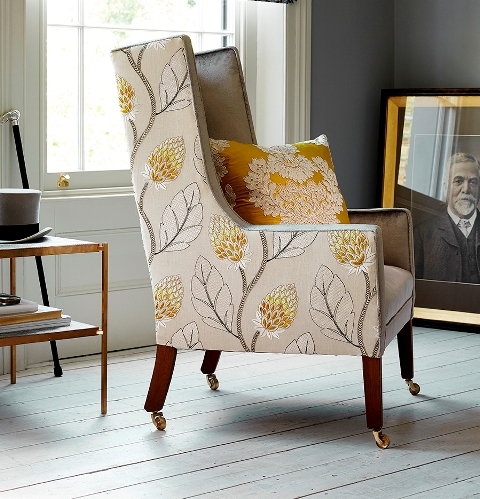 We have such a huge library of upholstery fabrics we can help you choose the fabric that's right for you. One of our latest projects. When stripped down it was found to be in a terrible condition and need to be re-built........ but c'est ici....back to it's former glory! An Interior Design project recently completed by Ambiance is pictured above. James Hare designs one of our favourites in Interior design. 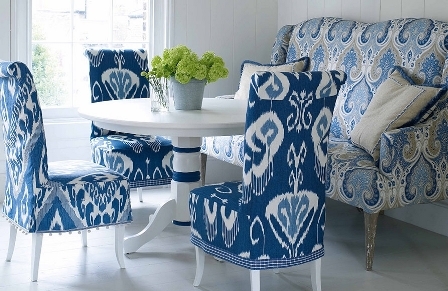 This fabric in beautiful, powerful colourways will suit your Interior design scheme! 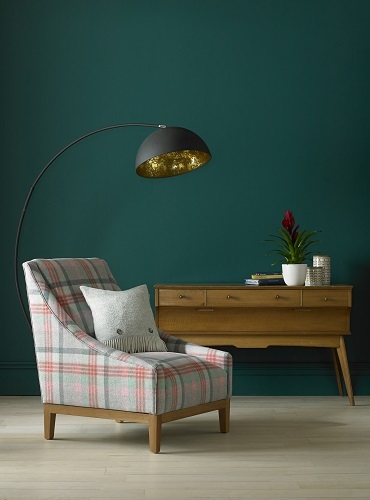 Beautiful curtains made with plaid/tartan pure wool and cashmere curtain fabrics with matching tartan wallpaper, with images that create the effect of textured pure wool fabrics, it is of superb quality. For many years this is what my customers have been asking for matching plaid wallpaper with fabrics. 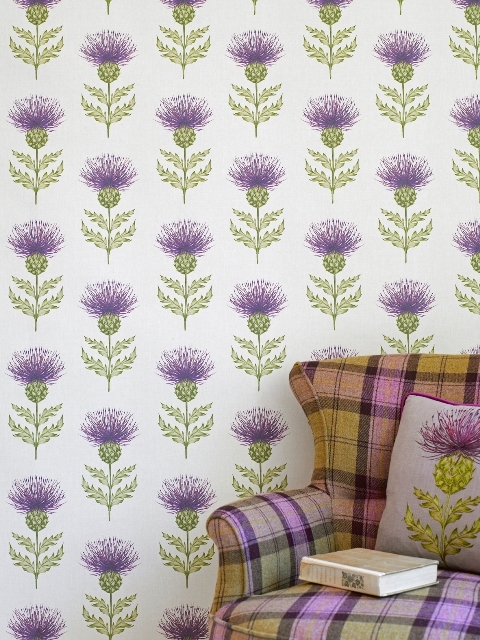 Please also ask about our Thistle fabrics and wallpapers. It will be worth your while to come down to Ambiance interiors at Gateside to view the complete collection. See wallpaper on our Wallpaper Gallery page. An absolute must in Interior Design. Choose complimentary Bespoke Lighting to create the ambiance you are trying to achieve. Have Lampshades made up with your own fabric (Soft or Hard shades available). Beautiful Floor, Table, Pendant and Bathroom Lamps. Serving areas throughout Scotland including Edinburgh, Fife, Perth, Kinross, Kirkcaldy, Dundee, Dunfermline, Angus, etc. Wow! Here's your chance to have beautiful plaid curtains or upholstery. These can be in pure wool, Cashmere or. Also available at economical lower prices per metre in plaid, fabrics in linen and cotton mixes. 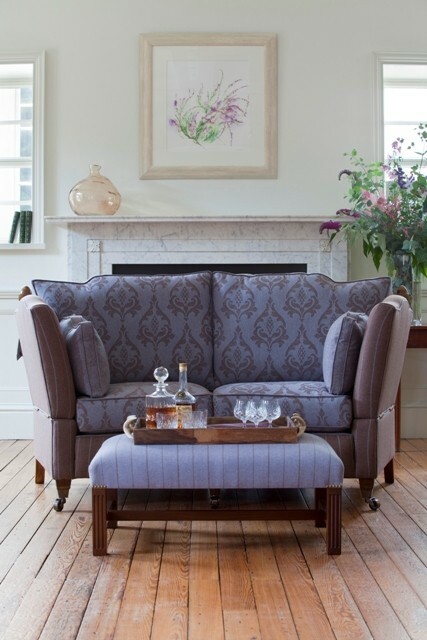 OR choose a Scottish flavour with Thistles and Tartans....Come in to Ambiance interiors to view our collections and feel the handle on these. Hand sewn, made to measure curtains and Roman blinds, Interlined curtains, curtain alterations, tie backs, soft furnishings, roman blinds, pelmets and valances, cushions, bed covers and bedspreads etc. 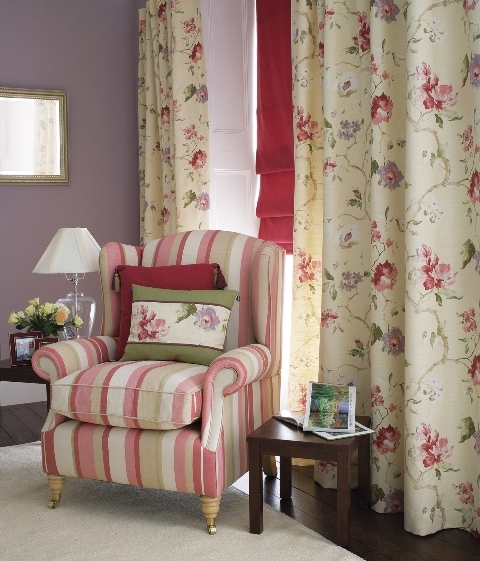 With our help in design we can help you choose the perfect fabrics to create the perfect room settings. 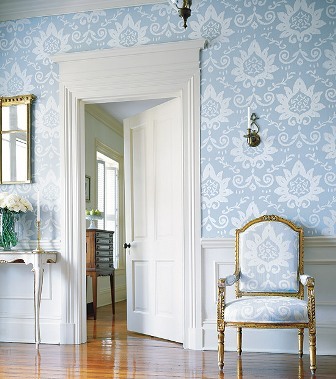 Feature walls are all the range as are textured wallpapers. We have a vast library of wallpaper sourced from the UK designer houses and from all over the world in Feature walls are all the range as are textured wallpapers. cluding France, Belgium, Spain and America. It's all about design! Don't make do with an old pole when there is such a great range to choose from. We supply a wide range of wood and metal curtain poles and curtain tracks (including options of bay window poles and tracks). There are wooden and metal curtain poles to choose which you won't have seen before in regular shops.You can have the choice of the beautiful (but expensive) designer poles/or more economic designs which are less expensive but still different. 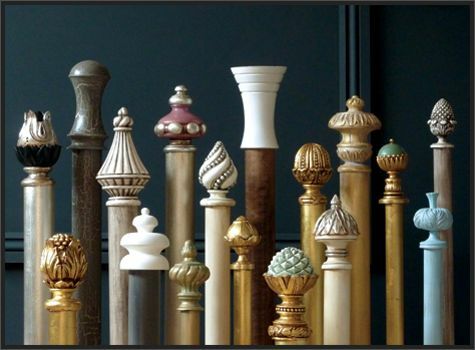 Ask about our 35/48 and 63mm solid wood poles with substantial brackets stained to match your furniture with a fabulous range of finials. Curtain tracks for straight and bay windows. Attractive professional aluminium tracks at reasonable prices which can be bent for bay windows. As you can see they are available in a selection of colouways. These tracks are very popular! They are designed with a glider track to carry light to heavyweight curtain fabrics which allow the curtains to open and close smoothly. 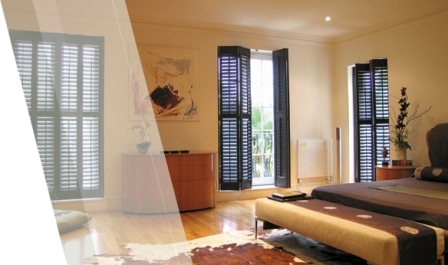 Blinds and shutters to suit every window situation. 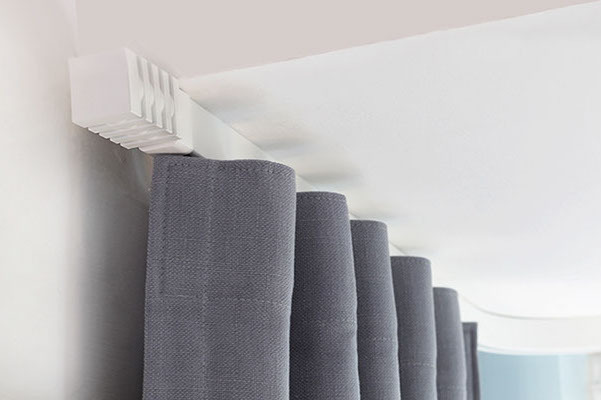 Roman blinds are the most popular window blinds we supply although we offer every type of window blind and internal window shutters to suit every window situation. 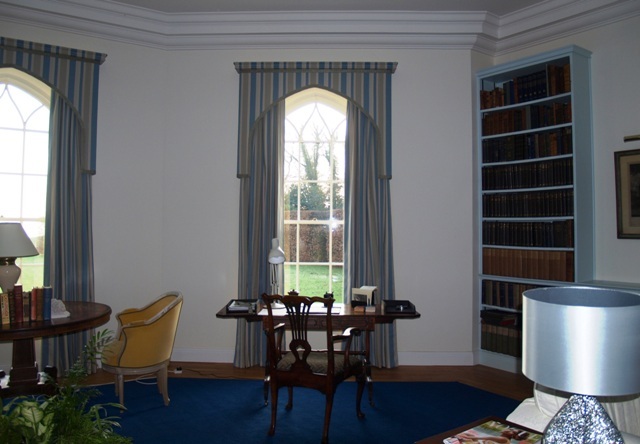 We look to compliment curtains in your room or provide blinds such as panel blinds which provide screens/room dividers. 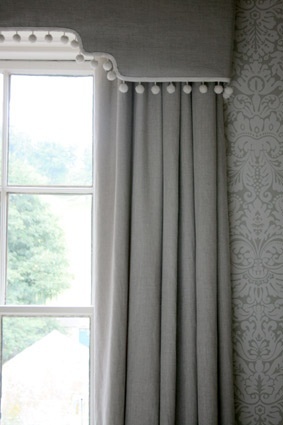 These curtains are 'made to measure' but are made in the factory at attractive prices. The range is enormous...Please visit us at Ambiance interiors to view the options. We can also offer matching soft furnishings etc. 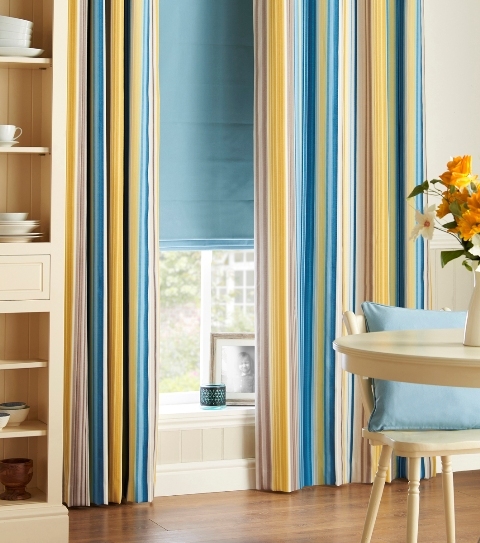 Ready made curtains or made to measure curtains for you to buy online. I wouldn't be surprised if the words 'Interior design' conjure up the ££££'s sign but there are situations when we may prefer the 'ready made' curtain route. We offer a good selection of luxury designs good quality linings and 6" pencil pleat for you to choose from. Good quality curtains can be costly and although at Ambiance interiors we try and keep costs to a minimum we have found a factory supplier we can trust. No Job is too big or too small from cushions to castles. We are expert at inspiring and creating the perfect environment you are looking to create. 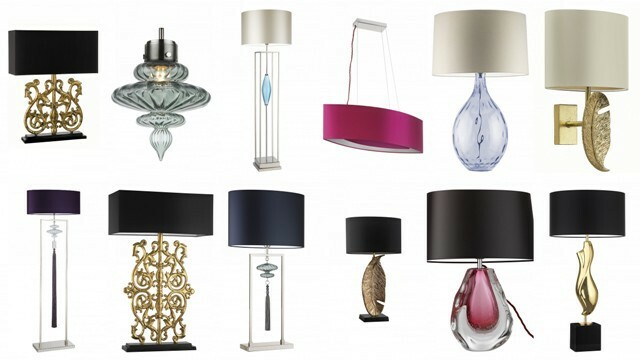 ...........and why not complete your scheme with bespoke lighting. Curtain fabric suppliers. 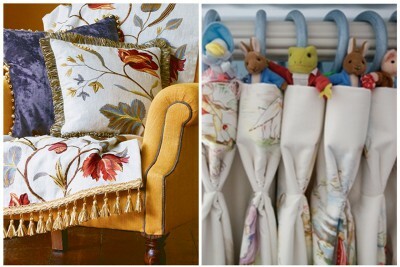 Upholstery fabric suppliers, Wallpaper suppliers. Welcome to the world of Ambiance interior Design!.........Here we offer guidance with designing a room, choosing fabric for upholstering your sofa, or just to choose the right fabric for a cushion to compliment your sofa......Our service is endless and can be supplied all under one roof! Tuesday - Please phone to confirm - 9 - 6.30p.m. Wednesday - Please phone to confirm - 9 - 6:30p.m. Thursday - Please phone to confirm - 9 - 6:30p.m. Friday - Please phone to confirm - 9 - 6:30p.m. Saturday - Please phone to confirm - 9 - 6:30p.m. Bank Holidays - Please phone to confirm - 9 - 6.30p.m.